Haha...That was a clever joke.I think your daughter has got your sense of humor. Cute one by purvi !! Waaah - Its posts like this that makes us go all warm and awwww. makes our days sunnier - thanks Preeti. that was so very cute! ha ha ha... people ask the same about underwear. They ask u if u have a hole in ur underwear, and when u say NO, hiding ur embarrassment, they ask u how did u put it on? LOL! I liked the tail text. Loved that picture of pups, truly apt one. That was such a cute post.......its much more fun to laugh when little ones crack the joke. The person who wrote their name in mandarin: thank you!! Just happened to read ur blog after being referred by a friend of mine. wow.. purvi is too clever..
ha ha ha.... god am laughing like a maniac!! that was very witty of Purvi.. god am still lmao!!! thats wat you called classy... i am definitely going to put this question to my colleagues..
Oh the socks one was really funny. I told this to my daughter and now she is going to ask her lil brother and father.This PJ is going like a chain mail now. When my husband went on tour while my children were young. My daughter used to wrap his bath towel around her while sleeping and my son would wear my husband's bermuda shorts.They would not allow me to wash them till he came back. Enjoyed and am still laughing as I could visualize you being question by the kids!! you guys are such an amazing family! hahahahah...clever Purvi! I have a few socks that have 2 holes too!;-)he! he! and a sweet post, Preeti! Snuggling with mom.....Mmmmm...Best thing in the world! And Purvi is one smart kiddo! Asha: that is so darn sweeeeeet! (what your children used to do) i guess its for a feeling of security--isnt it? MS: heheheheh :-) She reads all this in a riddle book :-) but thing is she remembers it and reproduces aptly :) btw--welcome to my blog.havent seen you around before, i think. Aww that's so cute.... takes me back to the days when dad used to travel and we used to wonder what does he do that when he is not around there seems nothing to do!!!! 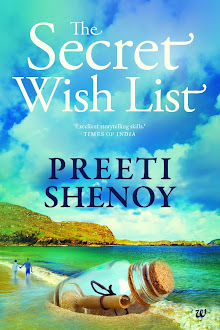 Preethi, just stumbled upon your blog..have spend the past 2 hours reading ..U write so well..
PS:I am going to oder your book now. Cant wait to read it..
Wagging the tail in delight...cute post! Will tell this one to my two too! hey preeti....nice post...and thank you for your wishes....:)...i'll take ur tag now, was off internet all dese days..:)..
Deepti: Have forgotten what tag :P But welcome back. Sindhu: u have two?! :-O !! Deepa: welcome to my blog! :)Very happy you liked..Am sure you will enjoy the book as it is adapted from my blog posts--a collection of 34 true incidents. - the kids are pleased that I am not around. 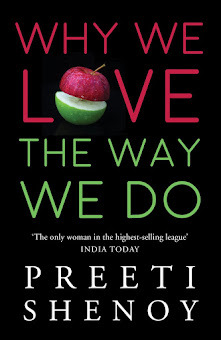 - Preeti enjoys the attention she is getting and tops it up with a blog post too. - her readers instead of sympathising with me, talk about her tail and all that stuff and about Purvi's sense of humour. I do not see any humour in this matter. Just a conspiracy to keep me travelling and away from home. But have to admit in all honesty though, that like a puppy I do come back running home and enjoy it (whether or not the kids get a chance to be with mom or not). Damn cute pic! Hope you didn't "shoe" ur daughter away after that sock-joke! Now isn't Purvi so smart :) Loved the text messages!